Blog Hop and Book Giveaway! Join in the fun as we introduce you to author Michael Scott Miller and his new detective series the Twisted Oak Amateur Detectives. 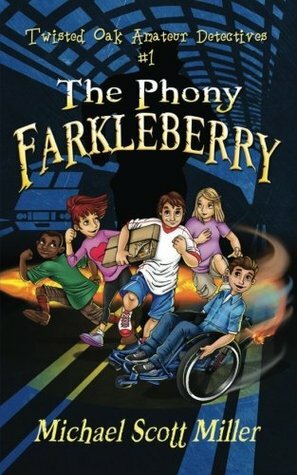 The first adventure is The Phony Farkleberry. For a chance to win be sure to follow, share and leave a comment with your name and email. Offer expires 1/31/15. Who would have guessed that five brainy, nerdy friends would find themselves in a position to become small town detectives? Tyler, Melanie, Amanda, Tubby and Dontrelle are all up for the task. The first adventure of this new group of detectives all starts when Tyler’s mom, who works at the Patterson Museum, decided to bring a big gala locally. The gallery will be showcasing a Thomas Farkleberry painting worth more than $230,000. The painting is on loan from the Michaud’s. Tyler invites Melanie to come along. They dress up in their fancy clothes and eat fancy food at the museum. While there, the duo overhears some shady conversation and planning of something not so good by a man and a woman at the gala. The next day it is discovered that the Farkleberry had been stolen. It was time for the five detectives to put a plan into action. Together they crafted three phases to catch the Resnick’s, the shady couple at the museum, and expose them. The first phase was assigned to Dontrelle and Tyler. They stake out the house of the Resnick’s and Dontrelle used his computer skills to hack into their network and dig for information while Tyler played look-out. Phase two is Tubby spying from a tree and Dontrelle as the lookout. Phase three happened after three days and it was up to Amanda and Melaine to get into the house and have a look around. They did this by telling the Resnick’s they were selling candy and then needed to use the bathroom. Once the three phases were completed the detectives split teams and learned about forgeries at the Patterson Museum and the National Gallery. They discovered that the stolen painting could have been an inside job and perhaps the Resnick’s hired someone to steal the painting for them. The detective team must figure out if the Resnick’s are guilty, was the painting a forgery, expose the culprits and get the painting back to the gallery for Tyler’s mom. The Twisted Oak Amateur Detective team have their first case and it’s a race to solve the mystery. Author Michael Scott Miller has created an engaging mystery series that boys and girls will love. This fun and fast paced middle grade read has likeable characters that are smart and easy to relate to. The story line is fun and readers can attempt to figure out the clues and solve the mystery themselves. Teachers can use this book as a read-along in class and discuss the events as they unfold. Parents will appreciate the series that will get boys who don’t like to read involved. Be an advocate for literacy. Thanks for your support and for stopping by. It's another great giveaway just in time for the holiday. For a chance to win be sure to SHARE, leave a comment and your email address. Good Luck! The 2019 National Geographic Kids Almanac is sharing more amazing animals, more science, more space, more nature, more history and geography that will get and keep the entire family engaged. Right at the beginning readers will learn about up coming events in 2019 shared by National Geographic Kids. Would you have guessed that there could be an International Kite Day in India in January? The Bantz brothers will be creating giant ice sculptures to help various causes. Your family can visit the Henn-na Hotel in Japan where robots rule. Try your luck at some fun prizes. Check out all of the participating blogs for a chance to win. Here at KBN be sure to share, comment and leave your name and email. Good luck! 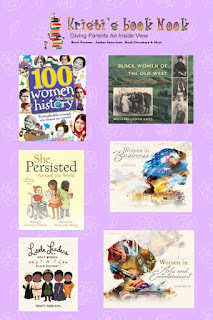 Kristi's Book Nook is sharing books in celebration of Women's History Month. Here are some suggestions of books you can pick up and read at your local library or neighborhood bookstore. Stealing is a bad thing and so is eating your own poo. But, that doesn’t stop Rabbit, these are his bad habits. Bear was awoken, during his hibernation, by something standing on his nose. He’d discovered all of his food had been stolen. Outside, Bear did not find his food and instead decided to make a snowman. A snowy day was perfect for that. It was then that he met Rabbit, who was a little grumpy. Together they made a snowman, and chased off Wolf, who tried to eat Rabbit. Bear and Rabbit were becoming friends and Rabbit began to feel less grumpy. Do you think Bear ever solves the riddle of his missing food? For the young learner and spirited entreprenuer. For a chance to win be sure to comment and leave your name and email. Everyone knows the Nike shoe, but do you know how Nike got its start? Do you know how the Nike swoosh came about? Do you know who Phil Knight is? All of your questions will be answered when you read this cool history of the story behind Nike and all of its failures and successes. Young readers, especially those who have an entrepreneur spirit, will enjoy reading about the journey of Phil Knight and how he got his start in the shoe business geared towards athletes. 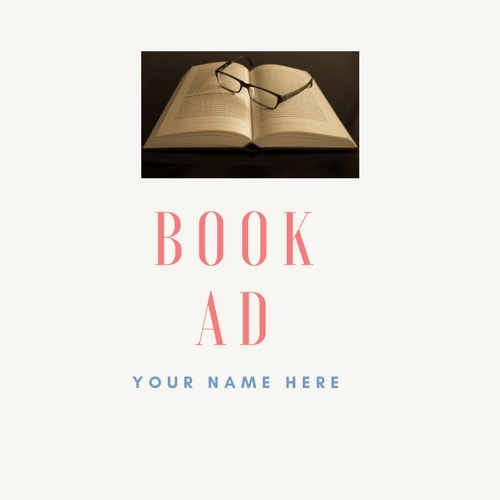 Not only that, young readers will learn business terms such as marketing, research, sales costs and so much more. Inside, readers will learn about the various athletes and their achievements while wearing the famous Nike shoe, designed just for them.